Treating speech disorders requires more practice outside of speech therapy sessions than it does inside them. Every time someone who attends speech therapy talks, (s)he can practice correct pronunciation and fluent speech. This means that family activities can be a great time for supporting a child with a speech disorder or difficulty. Reading aloud, storytelling, public speaking, sing-alongs and acting can all be fun family activities that give children a chance to practice their speech skills. Reading aloud provides families with a great chance to come together and entertain each other with their favourite stories. Children of all ages enjoy being read to, but the key to using read aloud time to help children with speech difficulties is to encourage (or require) everyone to participate. Either provide a selection of short books for readers to choose from, or take turns reading paragraphs, pages or chapters from longer books. Don't use this time to judge a child with a speech difficulty, or to jump in and tell him or her what (s)he is doing wrong, but rather allow each child to read their part and then congratulate them on a job well done. Much like reading aloud, storytellling can be an fun family activity that involves everyone. Storytelling may be particularly appealing to families who have members who do not yet read. Consider allowing each family member two minutes to tell their story, and have prompts on hand to get children started. Ask them about their dreams last night, what they would do with a million pounds or how they think life would be different for a family living on Mars. Listen to each child's story and analyse if a child with speech difficulty is becoming more fluent in speech, tackling problem sounds or avoiding known speech difficulties all together. Congratulate each child after a story well told. Public speaking may sound formal, but it needn't be. Tell your children you'll be hosting a family talent show but that they must speak as part of their act. Puppet plays, reciting poems, reading aloud original stories and making speeches are all great activities for children to practice. Use this time to let children know that they are all talented, and that all of them deserve the same audience respect and admiration regardless of speech or language fluency. Family sing-alongs provide an opportunity for everyone to be verbal at the same time. Select a favourite song or nursery rhyme, preferably one which incorporates the problem sounds for a child with a speech difficulty, and have everyone join in. You can do this on car rides, while cleaning the house or even while enjoying dessert. Some children may be surprised that when music and a tune is introduced their speech difficulties lessen. Even if they don't, silly songs and rhymes provide a great opportunity to make and repeat sounds that may not come up in every day life. Much like public speaking, acting allows children to speak in front of an audience and interact with others in a way that is grander than normal conversations. Allow children to come up with their own scripts, or provide a story for them to embellish. Costumes and even a little stage make-up can help transform children into actors, and you might even notice new personalities emerging once kids are "in character". Provide a stage, even if it's just the back garden, and tape performances if you desire. Playing tapes back later can be a great way for both you and your children to review how each child sounds and listen to any speech difficulties. 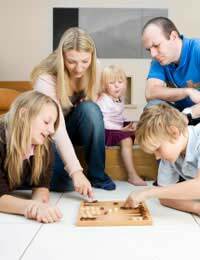 Family activities provide fun opportunities for children to practice their speech. Reading aloud, storytelling, public speaking, sing-alongs and acting are just a few options for activities which offer children with speech difficulties opportunities to practice as well as entertain the whole family.